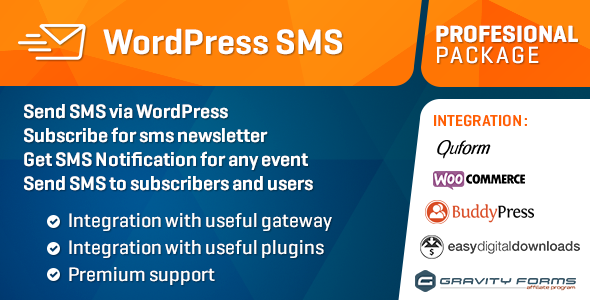 Professional package of WP SMS Plugin for wordpress. v2.1 (2016-06-04)- Added New filters `wp_sms_from`, `wp_sms_to`, `wp_sms_msg` in the plugin.- Added pswin.com gateway.- Added esms.vn gateway.- Added smsfactor.com gateway.- Added Arabic language.- Fixed `Undefined index` errors in ths plugin when wordpress debug is enable.v2 (2015-10-03)- Added login to wordpress ability with sms.- Added customers field to WooCommerce for send notification new products.- Added sms notification to WooCommerce for customer after submit order.- Added show all gravity forms to send an SMS to each form.- Added send a sms to field value to each form in gravity forms.- Added show all Quforms to send an SMS to each form.- Added send a sms to field value to each form in Quforms.- Added option to EDD checkout page to enable mobile field number.- Added sms notification to EDD for customer after submit order.- Remove Awesome support integration from the plugin.- Integration with buddypress for get notification of mention and reply to comments.v1.4.1 (2015-08-16)- Added vsms.club- Added ssdindia.com- Fixed Notification send sms after enable plugin- Fixed Integration with new ver of CF7- Update Arabic translation.- Added German translation.v1.4 (2015-06-03)- New integration (Awesome Support plugin) https://wordpress.org/plugins/awesome-support/ Added rules on mobile field number for subscribe form. (maximum and minimum number)- Added place holder on mobile filed number for subscribe form for help to user.- Added plivo.com gateway- Added bulksmshyderabad.co.in gateway- Added ozioma.net- Added sendsms247.com- Added smslive247.com- Added Chinese translator. (Thanks Jack Chen)- Improved subscribe ajax form.- Improved subscribe form and changed the form design.- Fixed a problem in send post to subscribers.v1.3.6 (2015-05-02)- Fixed Contact form 7 shortcode. currently supported.- Updated Twilio library.v1.3.5 (2015-04-09)- Added dsms.in webservice.- Added cpsms.dk webservice.v1.3.4 (2015-03-37)- Fixed unicode message in mobily.ws webservice.- Change bulksms webservice url.v1.3.3 (2015-03-07)- Added gateway.sa webservice.- Added ra.sa webservice.- Fixed clickatell.com webservice.v1.3.2 (2015-02-21)- Added magicdeal4u.com webservice.- Added livesms.eu webservice.- Added cellsynt.net webservice.v1.3.1 (2015-01-26)- Added Send sms to subscribers option When published new woocommerce products.- Added Mobile field number for woocommerce.- Added Change order notification sms for woocommerce.- Added Variables %status%, %order_name%, %customer_first_name%, %customer_last_name% for woocommerce new order.- Added Mobile field number in create a new user from admin.- Fixed notification sms when create a new user.v1.3 (2015-01-16)- Added Numbers of WordPress Users to send sms page.- Added Mobile validate number to class plugin.- Added Option for Disable/Enable credit account in admin menu.- Added Description field optino for subscribe form widget.- Added msg91.com webservice.- Included username & password field for reset button in webservice tab.- Updated: Widget code now adhears to WordPress standards.- Fixed SSL problem in clockworksms.com webservice.- Remove number_format in show credit sms.v1.2.4 (2015-01-03)- Added Gravity form notification to plugin.- Fixed problem in include files.v1.2.3 (2014-12-26)- Added low stock notification for WooCommerce.- Remove mobile country code from tell friend section.- Change folder and files structure plugin.v1.2.2 (2014-12-15)- Fixed bulksms webservice.- Fixed send sms url in admin menu.- Fixed sms items in posted sms page.- Fixed subscribe items in subscribe page.- Fixed Mobile validation number.- Fixed Warning error when export subscribers.- Changed rial unit to credit.v1.2.1 (2014-12-06)- Fixed clickatell webservice.- Fixed Notifications sms to subscribes.- Fixed Mobile validation in subscribe form.- Added Reset button for remove web service data.- Added Turkish language.- Added Danish language.v1.2 (2014-11-14)- Added dot4all.it webservice.v1.1 (2014-11-11)>- Added mobily.ws webservice.v1.0 (2014-11-06)- First release.